Tabernacle was the first time I worked with Elena but our paths has crossed before: we both performed in the 2007 Dadao Live Arts Festival in China and had an opportunity to visit temples together in Hangzhou and Xiamen. I remember sharing a welcome western-style breakfast with her in the upmarket hotel in which she was staying when, at the end of the long tour, my reserves of openness to new experience had run too low to face Chinese breakfast in my hotel. Elena performed a solo for Michael Klein in that festival and I found it entrancing to watch her bring that dance to being each time I saw it on the tour. It was a mystery then how she made it happen: I could intuit that it was a rigorous combination of concentration, memory, association, presence, sensitivity and articulate physicality that made it so; but knowing the ingredients is not the same as knowing how to make a nourishing meal. By the time I worked with Elena as a performer in Tabernacle, I knew that though we had different ways of making work, that the kind of investigation her work undertakes brought audiences and performers to the kind of place I wanted them to reach, albeit by different means. 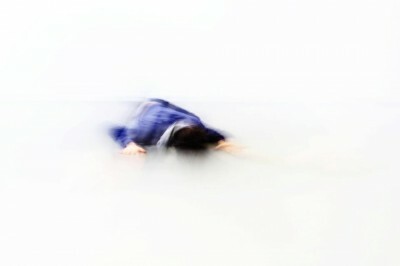 Rehearsing with her as a choreographer in Cure has confirmed that realisation. Elena was the last of the choreographers for me to start work on for Cure (I am almost finished creation processes with Matthew and with Bernadette). One of the first things she asked me to do was to learn to make an origami crane. (You can follow the tutorial here if you want to have a go). The process requires care and concentration and we discussed the relevance of care in the work of recovery. As a doctor of Chinese medicine, she has a deep understanding of the careful, caring commitment to a process of recovery that is required by both patient and doctor. She told me the story of Sadako Sasaki who developed leukemia after the atomic bombing at Hiroshima. A friend told her of the 千羽鶴 Senbazuru legend and that if she made a thousand paper cranes that she would be granted a wish. The crane is a creature of good luck, good health and long life in Japan. However Sadako didn’t complete all the cranes before she died and her friends completed them for her instead. There is a statue to her now at Hiroshima and children come to make cranes there each year in commemoration. 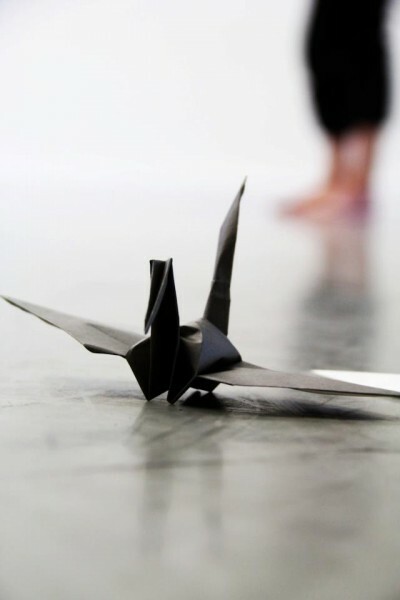 As part of the choreography, Elena has asked me to make a thousand cranes before the premiere. I’ve worked out that I have to make 14 cranes each day to meet my quota. Of course the task is not just about superstition. The process of careful folding is a choreography of my body and a daily training that shapes my body-brain architecture. For that reason the pedagogue Froebel encouraged the teaching of origami to children. There were three kinds of folds in his method: folds of beauty, folds of knowledge and folds of life. These categories have helped inform the movement material I’ve generated in Elena’s work. 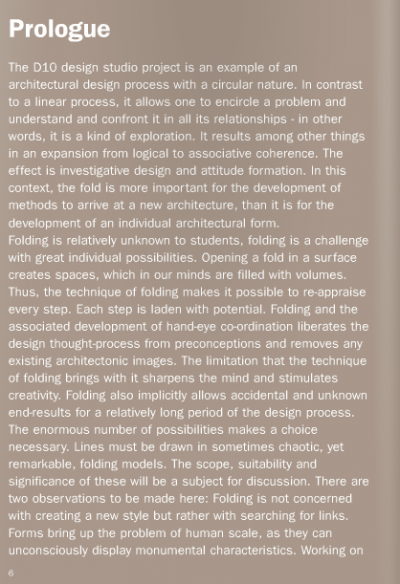 Her choreography has also been informed by the use of folding as a design process in architecture, as described in the book Folding Architecture by Sophia Vyzoviti. The first week of rehearsals I was also teaching morning professional class at Dancehouse. 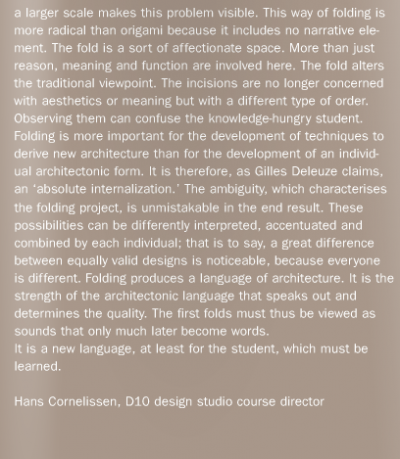 I teach Cunningham technique in those situations and though the energy of that kind of work was not the same as what Elena needed from me, still something of the folding architecture of Cunningham’s work felt relevant. It was interesting then at the end of the two weeks to have Cheryl Thierren and Ashley Chen (two gifted ex-Cunningham dancers) in the studio among others from John’s Scott’s cast for the White Room who came to see a run-through of Elena’s piece. We had earlier in the day showed it to friends from the Macushla Dance Club and that process of sharing the work in its early stages is very valuable to me as a performer but also as a way of really learning how the work is communicating. I was pleased that people who know me could see how I moved differently thanks to Elena’s work and especially pleased that some could see her in how I moved. Working on E-motional Bodies and Cities, I’ve been aware of carrying the movement imprint of Matthew, Bernadette, Elena, Stéphane and Mikel in my body already and it is refreshing to have the opportunity to give expression and form to the influence I carry. John Scott, with his inimitable erudition, told us that Nijinsky’s Sacre du Printemps has a crane-inspired dance in it. In this much-celebrated centenary year of the ballet’s making, it is good to know that in this work we have a quiet homage to our choreographic heritage.